KTM Duke 390 now comes with a new color, with display is wrapped with black color combination the color orange a typical KTM so it looks more fierce, the presence of this new color will add color variant of the KTM Duke 390 that already exists, the color orange and white. 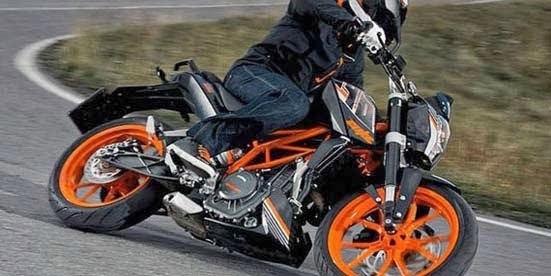 With the presence of new colors is most likely KTM Duke 390 will also be targeting the Asian market, particularly India. Strategy is the addition of color conducted KTM to boost sales of his motorcycle. To its machine did not undergoes change KTM Duke 390 still cradling machine capacity of 373 cc willing to throw the power to 43 hp with peak torque to 35 Nm. KTM Duke 390 that has an empty weight of 145 kg is claimed capable of racing with a top speed of 170 km / hour.